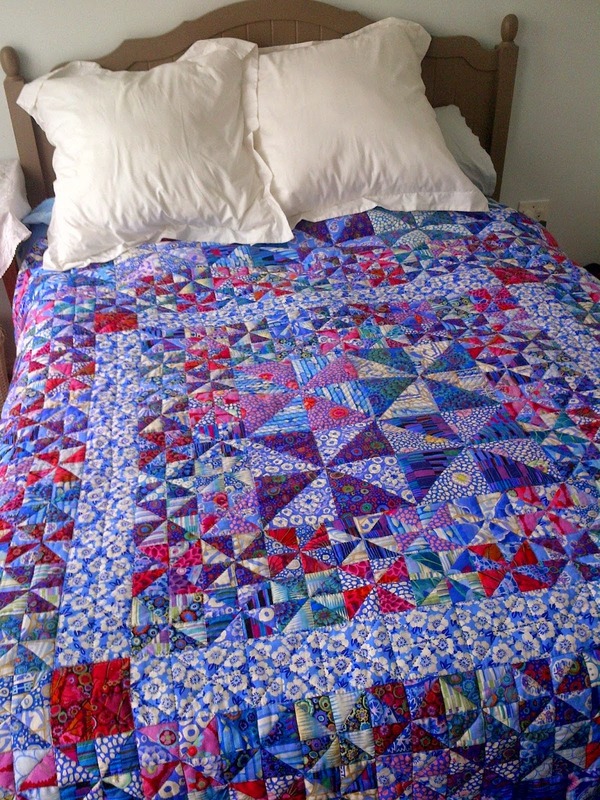 I finished quilting and binding my Summer Star Quilt at long last. I finished piecing the quilt top almost 2 years ago. 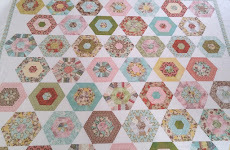 The pattern was based on the New Orleans Star Quilt by Liza Lucy Prior in Kaffe Fassett's "Kaleidoscope of Quilts" book. 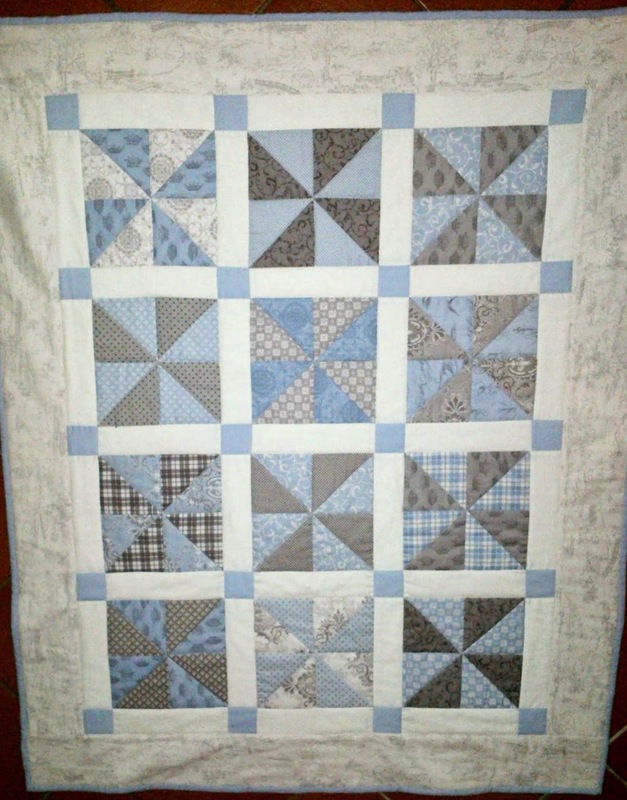 I added my own pieced border made up from leftovers from cutting the star blocks. The finished quilt measures around 62"x 74". I used the Philip Jacobs print, Japanese Chrysanthemums in yellow, for the backing. The binding is Roman Glass in Ochre. 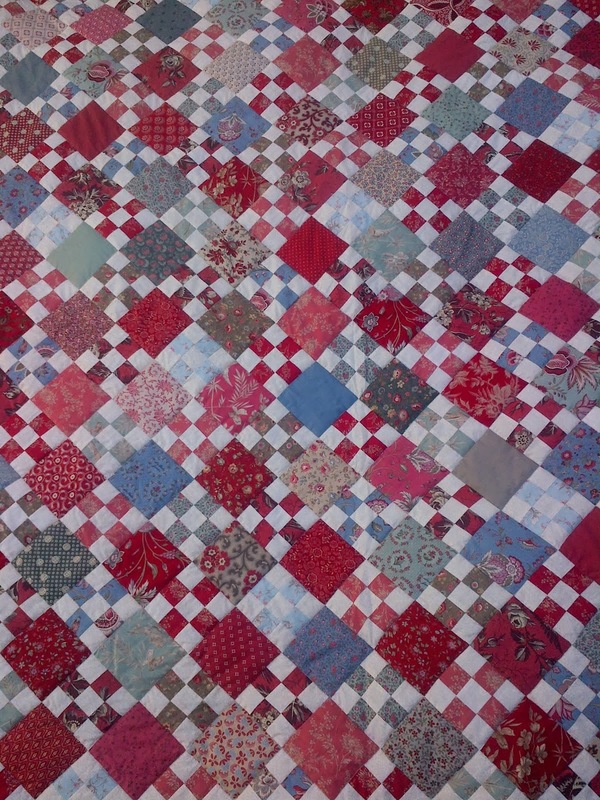 My next big quilting project is going to be the Postcard Quilt from Kaffe Fassett's book "Quilt Road". Many of the fabrics used in the quilt are out of print, so I will have to make my own substitutions using modern Kaffe Fassett fabrics, but I will stick to the same palette of reds, pinks, blues, greens and grey. 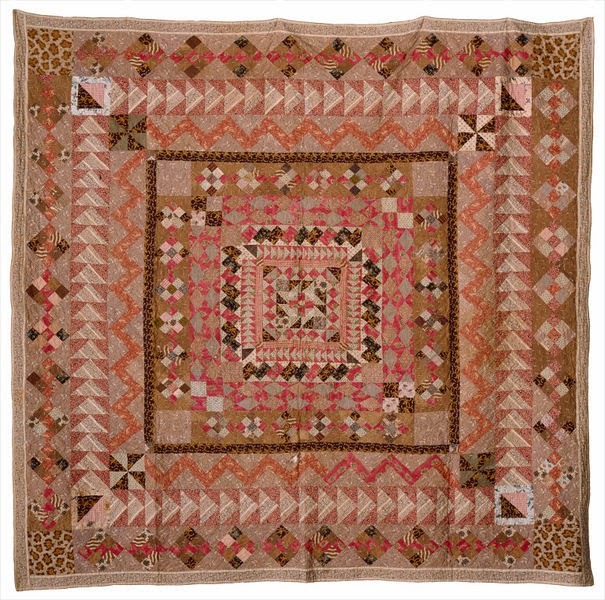 I found the original quilt (made in 1830-1840) that inspired the Postcard Quilt on the V&A's website recently. It is not shown in the Quilt Road book, so it was nice to see it. I love the Leopard print blocks, quite fun! Congratulations on your beautiful finish!! I have always loved this quilt. I remember when you started it. I think it's quite a trick to make something so predominantly yellow. You pulled it off so well! Ooh, I'm very excited about your next adventure. It's going to be wonderful in your fabric choices. If you have trouble finding the leopard print, I have some to send you. That is a great finish! I love yellow so how could I not love this one. What a beautiful quilt! I love all those yellows together. Your new project will be wonderful to make. I've seen the original, the animal prints looked so modern for an old quilt. 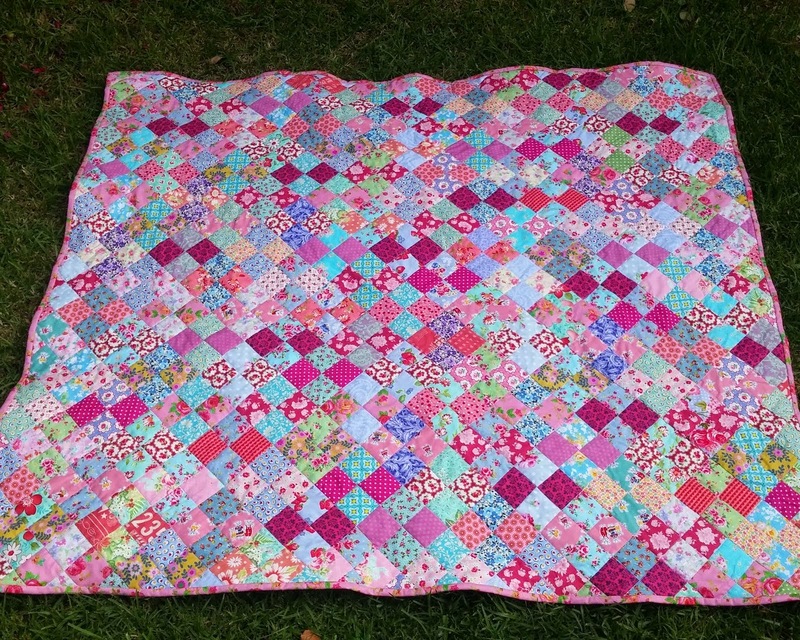 Congratulations to another finished quilt! You have had a busy weekend on your machine and it turned out stunning. I like your new project too, can't wait to see how yours turns out. I remember when you were working on the top. The quilt is beautiful, looks great on the bed. Reminds me of hot summer days and pink lemonade! Looks like you will be happily busy with your new quilt. It will be fun to choose fabrics for the quilt. Looking forward to seeing it's progress. Yellow summer star quilt is really very pretty and yellow was always a no no for a quilt and now look at this wonderful piece of art. Love it. 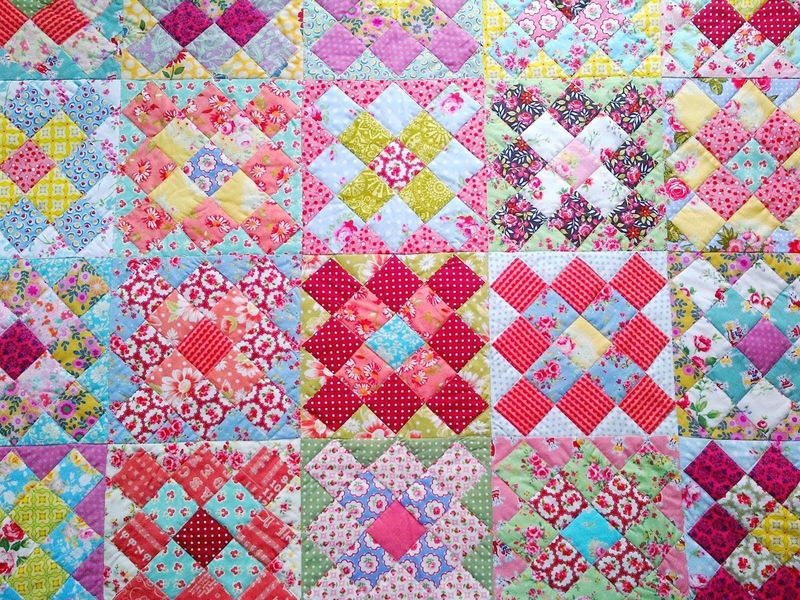 uuuhhmm thinking maybe I should make something yellow quilty too.